The BION OLAP Interface provides the ability to access arbitrary BEx queries and to extract the result as flattened CSV file. This enables the business departement to create CSV files (e.g. for regulatory reporting) from approved or self-defined BEx queries without having to manually execute MS Excel or to order IT to create a corresponding APD process. 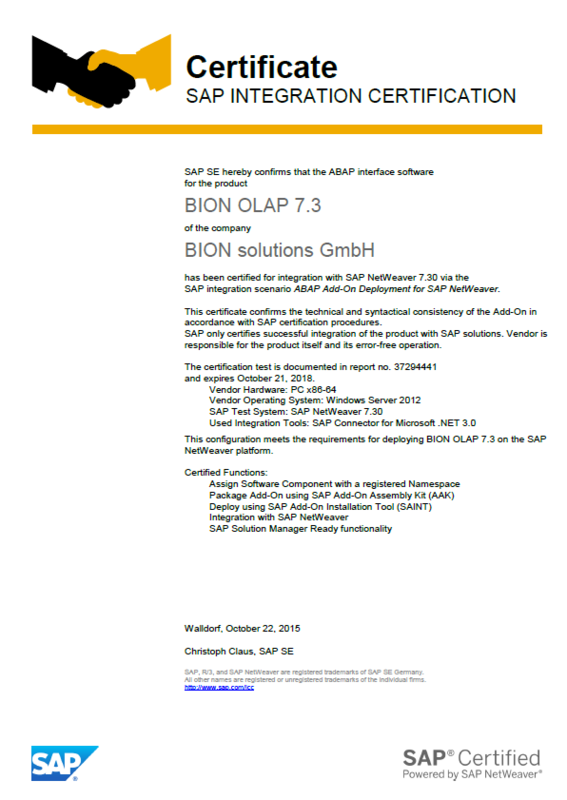 On 2015-10-22 BION Solution GmbH has received the SAP SE certification for the ABAP interface software BION OLAP 7.3. The solution has been certified for integration with SAP NetWeaver 7.30 via the SAP integration scenario ABAP Add-On Deployment for SAP NetWeaver.